Throughout the past few years downtown El Paso has experienced many transformations as a community. Many people overlook the fact that even though construction is taking over the area, there is a popular biking movement. Taking a turn down the road of Downtown El Paso, we notice the many beneficial things our city has to offer the community is palpable. In September of 2015, Bcycle started their company with a total of 80 bikes and eight stations to place all 80 bikes. The development of bike usage has increased drastically from June 2015 to June of 2016 receiving one thousand participants, and is constantly increasing today. A year later the amount of El Paso residents helped increase that number by two thousand. “Bcycle is constantly growing. We always have new riders start using Bcycle to get their way around Downtown,” Bcycle Operations director, Cesar Martinez said. Pedestrian Erik Ramirez was one of those new riders who tried their first ride, and was surprised with the satisfaction El Paso Bcycle was able to offer. “Honestly this was my first time using one of these bikes, and it was a whole lot easier than driving my car to find my way around,” Ramirez said. As pedestrians walked downtown many notice the bright red bikes parked in several locations, but do not know the purpose these bikes serve. 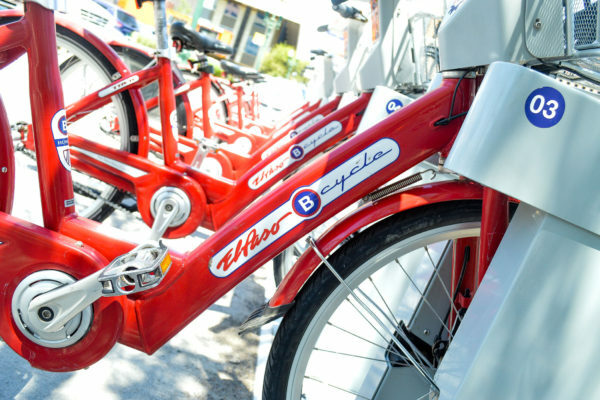 The Bcycle program offers several affordable memberships to the community in order to attract more customers for them to consider becoming members. A daily pass is six dollars, and every half hour that is added on is an additional two dollars. Package two consists of 30 dollars for thirty days. Package three is often used for students who attend the University of Texas at El Paso. This package is worth 50 dollars for a semester long. Lastly, package three is the annual membership. For 75 dollars you receive 365 days worth of rides. “I’d definitely buy the yearly membership because I find that it would be a lot cheaper, and easier to get around downtown,” said Ramirez regarding the variety of memberships. Bcycle allows getting around become easier and also throws in a positive cardio workout to the rider. “It tired me out, but it’s cool because it gave me a good workout,” Ramirez said. “We’re very happy with the outcome the company is receiving,” Martinez said. With a variety of stations in different locations the company can incorporate more of the community to join in on the fun. Stations can be located in Pioneer Plaza, Cleveland Square, Anthony street, El Paso County Courthouse, UTEP Sun Bowl Stadium, UTEP academic Services, etc. College students benefit from Bcycle because it gives them an easier form of transportation between class to avoid traffic. “Using the bikes is easier to get to class because it saves time from looking for a parking,” University of Texas at El Paso student Andy Adame said. If the community joins the ride we can help turn the environment in Downtown El Paso into a healthy and positive one. “If you are using a bicycle insteading of using a car, truck, or bus it extends a life,” Martinez said at last.